A lot of couples go for a sunset wedding but another great option is a sunrise wedding. Soft light and cool temperatures make a sunrise wedding a great choice. 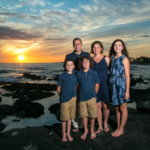 This couple chose Kukio beach located just south of the Four Seasons Resort Hualalai. 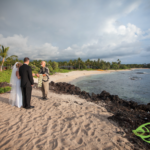 Kukio beach is a public beach location and therefore requires no fee to get married there. 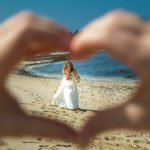 This couple loved the sunrise option because they had their entire day to enjoy being a newly married couple. The couple was staying close by and therefore were able to take a morning stroll to the wedding enjoying the beautiful weather and views of Hawaii’s beautiful waters, palm trees and flora. The groom greeted the officiant with the sharing of the breath or Ha. 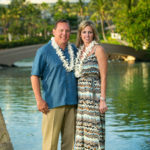 The couple exchanged leis and had there rings blessed with a prayer and sprinkling of salt water.